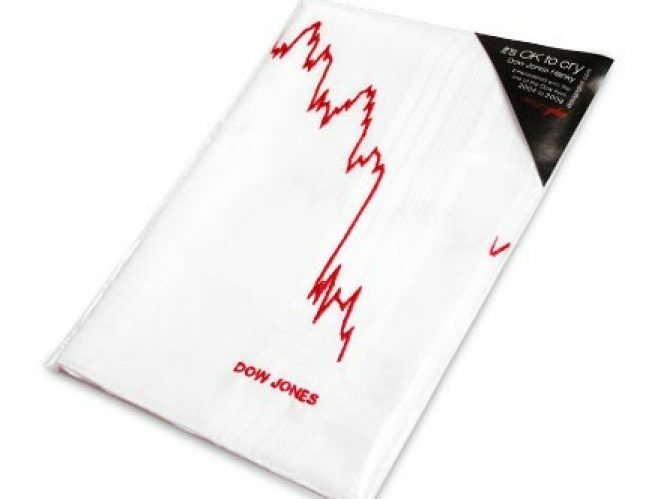 The Dow Jones Hanky: classy, just like you. What: The 100% linen (no corners cut here! ), 16.5"-square "It's OK to Cry" handkerchief from Design Glut, which traces, in red, the drastic tumble of the Down Jones between 2004 and 2009. Why you need it: Hey, laid-off banker: Times are tough, but at least you can sob and snivel over your lost millions in style. How much: A recession-friendly $28 -- though as Thrillist points out, for a little extra, Design Glut will tailor a hanky to your own personal portfolio. At $95, it's not exactly cheap, but it's probably the last tailoring you'll be able to afford for a while.